Loyal reader, Joseph Bacon, hit us up on Facebook to get us to check out Fusion Burgers. Joseph Bacon not only has a kickass name, but he is also the creamed corn wrestling coach to the stars. Fusion Burgers, like Plan Check, had an Umami Burger pedigree. I hoped that the pedigree was from the pre-mediocre days. 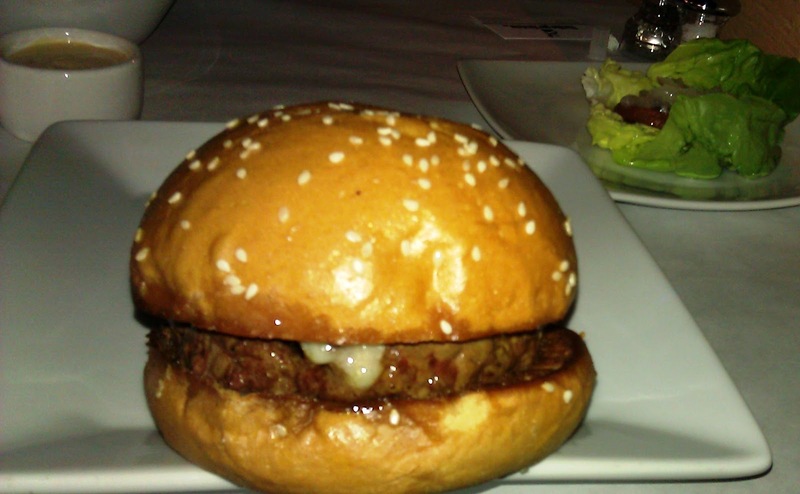 Umami Burger fell far and fast. Fusion Burgers was in the Highland Park district of Los Angeles. It was FAR (20 miles) from the world headquarters, but we travel far to sort things out for you. Parking was plentiful and free in the small, attached lot.We were seated instantly. Betty, the manager, was super-friendly and informative. In addition to various facts about the preparation and ingredients, we learned that the newish Fusion Burgers was family-owned. I ordered a Classic burger and settled in for a ten-minute wait. The tasty smell of burgers sizzling on the griddle further whetted my appetite for a cheeseburger. The Beef: The cuts in the house-ground beef blend were a closely-guarded combination of primal cuts. I ventured to guess that Chuck, Sirloin, and Short Rib were the component cuts. The fat content was held down to 18% in the 7-ounce patties. The cheeseburger was strongly beefy. The patty was properly juicy. There was a faint flavor of funk from wet-aging. Much of the expected complexity was muted by a really strong note of iron. Other reviews related that the burgers were cooked in cast iron skillets, but Betty indicated that the burgers were seared on a cast-iron plancha. Regardless, the cooking surface was cast-iron. The strong iron taste led me to believe that the cooking surface was not properly seasoned. The bite was just right in terms of firmness and mouth feel. The coarse grind really let the quality of the beef shine through as it lingered on the palate. 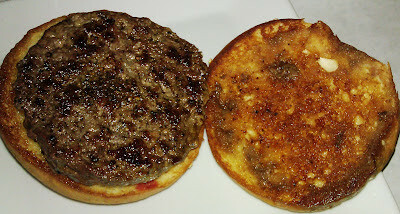 The Seasoning: The exterior of the burger patty was dusted with a peppery/savory spice blend. This was appropriate to the beefiness of the burger. It served to further enhance the competent sear. The Sear: Yes! 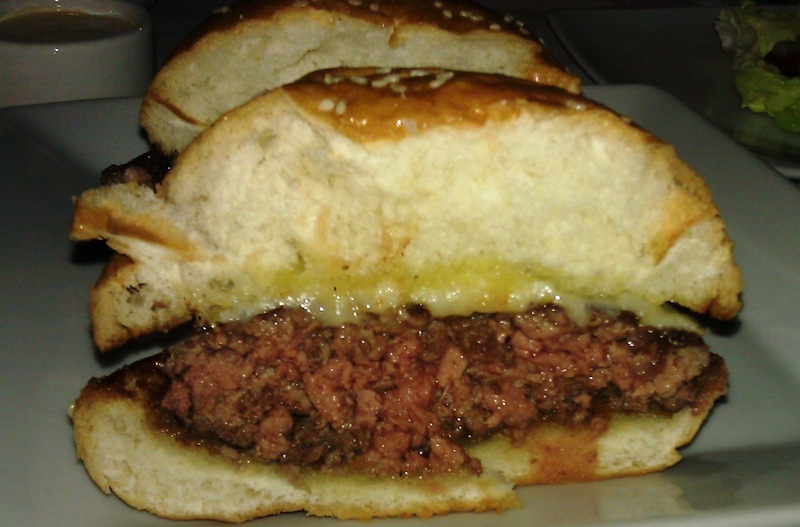 The sear on the burgers at Fusion Burgers was thin and crisp. That was the advantage of cooking on cast-iron. We saw a similar sear on the burgers from The Brindle Room in NYC. The sear was completely enjoyable and satisfying. The Preparation: The beef was ground and blended in-house. The burger patties were hand-formed ever so gently to create a loose, hearty bite. Fusion Burgers nailed the request to cook my burger Medium-Rare. The Cheese: Bah. This was White Cheddar, but it was relatively uninteresting. American Cheese would have amped up the Umami in this burger. Honestly, the burger would have been just fine without the cheese. The cheese was properly melted, though. The Bun: The bun at Fusion Burgers was a fresh, moist, moderately toasted, seeded Portuguese Roll from Melrose Baking Company. The bun was mildly sweet. Mostly it served to deliver juicy, seared ground beef from plate to face. The bun performed that simple task most adequately. The Meat To Bun Ratio: Perfect...just perfect. The Toppings: The Bibb lettuce was fresh and sweet, and the roasted tomato slice provided a nice hit of sour and umami. The Fries: These were an extra $2.50, and that was way too much for spuds. Still, the fries were cut in-house. The fries at Fusion Burgers tasted strongly of the earth. I really got the sense that I was consuming a tuberous root. I found the strong potato flavor refreshing. 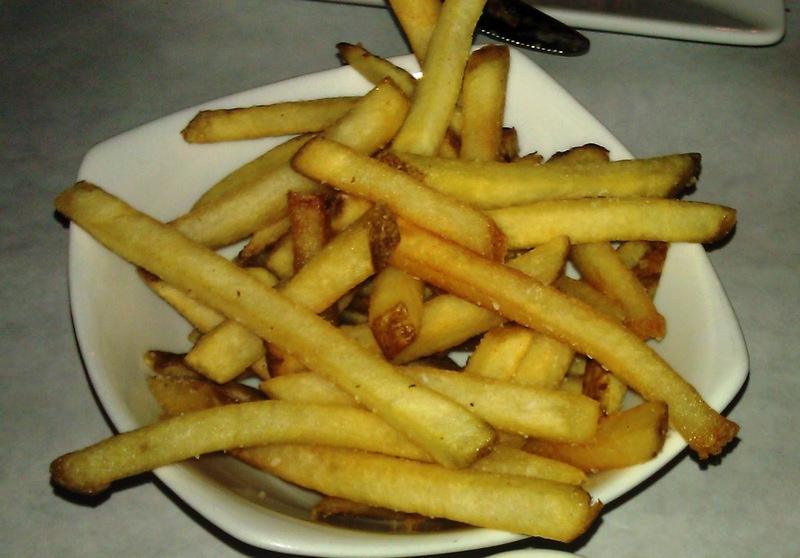 The fries were properly crisp, golden, and salted. The Value: The Classic burger at Fusion Burgers was $8.50. The fries were $2.50, and a beverage was $2.00. That was $13 bucks for a better than average cheeseburger meal in a location that was a little dodgy. The value was average. Fusion Burgers served up a cheeseburger that surpassed the then-current quality exhibited by the once mighty Umami Burger. The ingredients were strong, and so was the preparation. The sole failing was the iron-heavy flavor from the under-seasoned cast-iron cooking surface. Burger Review : Fusion Burgers made a darn fine, high-quality burger without employing the trickery of its Umami Burger roots. It's an awesome place great service a small but nice and clean place and most importantly the food is soo good!! My favorite are the parmegiano the dans inferno and chili cheese burger they also have great sides!! I have heard it is family owned n run restaurant and that gives then an extra point!! !